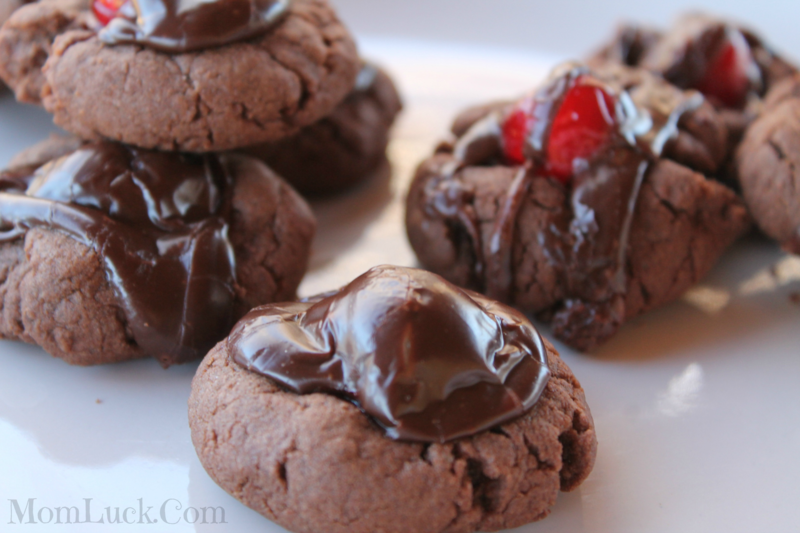 Chocolate and cherry Cookies. I can’t think of a better combination. One of my favorite treats to make for my family is chocolate covered cherries. Each time I make this cherry candy treat, they don’t last long. 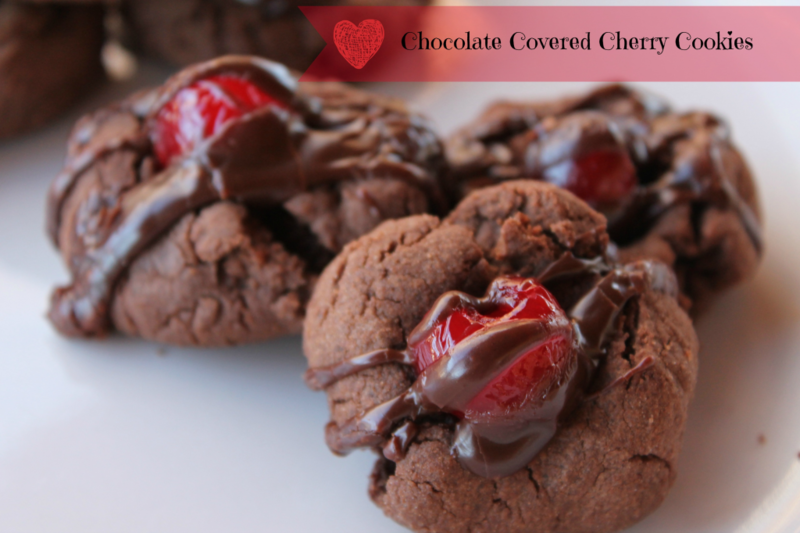 Recently I came across a recipe for Chocolate covered cherry cookies. Since since my family loves cherry candy so much, I knew I had to give them a try. These cherry cookies turned out better than I could have imagined. 1. Fire preheat your oven to 350 degrees F.
2. In a large bowl, beat the butter and sugar together and mix well. Next add the egg and vanilla and mix well. Sift the flour, cocoa powder, salt, baking soda, and baking powder and beat into the egg mixture. Stir until smooth. Roll the dough into 1-inch balls about the size of a walnut (larger if desired). Place on ungreased cookie sheet. Press center of each ball with your thumb. 3. Drain the cherries in a bowl and reserve juice. Place a single cherry in the center of each cookie. 4. In a medium saucepan, heat the sweetened condensed milk and chocolate chips until the chips are completely melted. Watch carefully and stir often so the chocolate doesn’t burn or stick to the saucepan. 5. Stir in 4 teaspoons of cherry juice into the chocolate. Spoon about 1 teaspoon of the mixture over each cherry and spread to cover cherry. More cherry juice may be added as needed. 5. Bake the cookies in a preheated oven for 10 minutes. These homemade cookies are so good! If you’re looking for a great cookie recipe I encourage you to try them. If you do make them, let me know what you think. These look yummy and would be great for valentine’s day. Oh my, you are another blogger to tempt me so early this morning. I am already hungry for breakfast but seeing yummy food isn’t helping me! It’s making me want to bake. Those look good! My father in law is obsessed with all things chocolate cherry, I should make these for his birthday. These look really yummy, I will have to try them out. 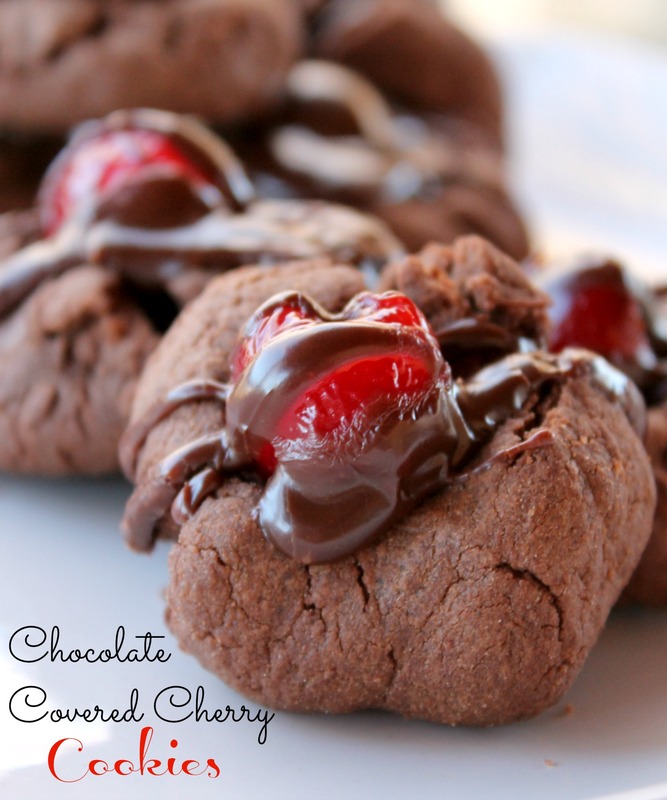 I love Chocolate Covered cherries so I am sure I will love these cookies as well!! What a creative idea for a cookie! These look delish and super easy to make. Thanks for sharing! Chocolate covered cherries are one of my favorites. I don’t think I’ll be able to resist making these! I can’t do cherries, but maybe I need to fix these for my mom for V-Day. She loves cherries! Thes elook so yummy, something about those cherries. Oh, my , GOODNESS!!!!! You aren’t helping my diet, girl! Those look awesome! I like chocolate, but it can be overpowering, so the cherry would make these amazing, I think. I’m definitely trying these. Thanks! I’m literally drooling right now as this looks so good! So cute and I love that you’re using the maraschino cherries – yum! These cookies are right up my alley. They look scrumptious! I agree this is a great combination they look awesome. Oh my gosh, those look amazing, and my youngest would love them because they have cherries! Those look amazing, especially with the cherry in the middle! Oh my! Those look so good! I love chocolate covered cherries! I love chocolate covered cherries…so yummy! I wouldn’t mind having a few of these with my coffee right now. They look delicious! I think the idea of having them in cookies is even more appealing than as candy. These look super tasty and decadent. These turned out pretty! Bet they taste just as good too. These cookies look so delicious! I would love to make these for Christmas. The cherry looks so cute on top! They look very easy to make.Thanks for sharing!